People judge your business based on your digital presence so your site should reflect trust and credibility and provide visitors with an excellent experience. Feelings of trust towards your company should be carried out through every aspect of your business especially your website. Avaris multipurpose theme is crafted for your business success as it helps you to reach your business goals in many ways. Avaris is a premium theme as it combines functionality and elegant designs furthermore it maintains its consumer’s time and effort. Avaris meets every customer’s needs throughout a great variety of demos so we can say it is the best theme for a wide variety of needs. Those demos are created regularly so if you cannot find your niche so far you will soon. Each one provides different pages and features for instance Avaris restaurant includes menu, recipes and reservation and hotel demo provides accommodation page. Definitely there is no need to mention that all demos are included with every purchase. One click installation easily add the pages of the demo you choose to install just by one click. Throughout this feature you can create an elegant website with no need for developers and with the least amount of effort and time. One glance can turn someone into a customer or let the visitor click away so the Design is so crucial as it supports your messaging and infuses perception of your brand. Poorly designed websites reflect negativity on the business and that’s Avaris designers’ main concern. Avaris design is fussily crafted by a group of talented artists who lead other designers in managing a creative, unique and personal design to help our customers achieve their success with such an elegant design. Avaris allows you to personalize your design using The Theme Options which allows you to change nearly everything in your website including colors,font,photos,Backgrounds and logos. This Theme Options facilitates the process of making the theme in harmony with your brand identity. Our design provides clear navigation that enables the consumers to easily find what they are looking for. It is provided with a responsive design to match screens of all sizes. Avaris documentation includes tutorials and tips and tricks that help the consumers to get the best out of the theme. It provides clear instructions to help the consumers install the theme and the demos moreover it provides a detailed information about the theme options and the header builder and blog settings. All in all it covers most of the issues that you might face from the moment of installation till the very end moment of your experience. 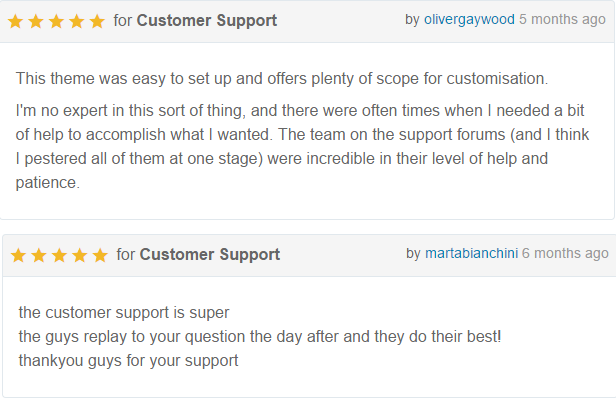 Avaris support team is one of the best support teams ever who works continuously to ensure the fastest response. Although there is no need for support with an efficient theme such as avaris, But they are highly responsive and incredibly helpful so they can guarantee that there is no concerns in dealing with the theme. Support includes posts and videos which helps you in configuring your theme. Regular updates are carried out for features like new integrations with popular plugins and bug fixes too. As for the pricing Avaris theme is priced at 59$ (future updates, 6 months support from creiden and all demos are included) which is totally affordable and suitable for the value of the theme. The price is super affordable if the support is worth paying for.